UNO’s given everything for hockey. Coaching legend Dean Blais was hired to make the program a national title contender. The sport that draws 7,500 fans per home contest led the University of Nebraska at Omaha down a Division I path that ultimately meant sacrificing football and wrestling. Baxter Arena was built to provide a big home ice advantage. High expectations were finally realized when Blais led UNO to its first Frozen Four following the 2014-2015 regular season. Following that historic run a young Mavs team completed an unbeaten non-conference schedule in 2015-2016, even earning a No. 1 ranking, only to struggle for goals and wins the second half. Losing eight straight games killed any playoff hopes. 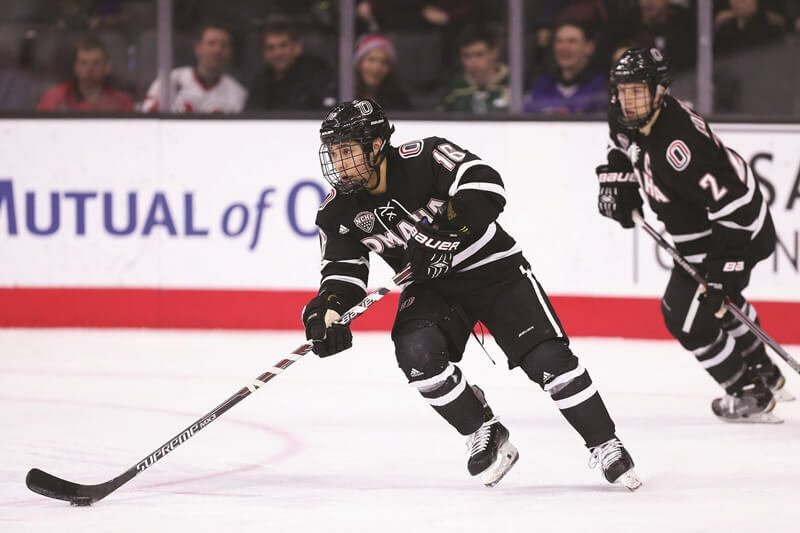 Those losses came to elite clubs in the famously tough National Collegiate Hockey Conference, and Blais knows his returners will be one year older and stronger heading into this season. UNO plays the University of Alberta in an Oct. 8 home exhibition before trekking to Fairbanks, Alaska for the Brice Alaska Goal Rush tournament. UNO opens the regular home schedule against Vermont Oct. 21-22. The Mavs end the season with several series matched against NCAA tourney teams. After last year, Blais hopes his guys are “a little more committed, a little more hungry” to better weather another challenging stretch. “I think they are,” he said. “I think as a group they were very disappointed overall with their production. But that has a lot to do with the NCHC and the competition we played, too. We were the only undefeated team in the country non-conference, which should have put us in great position pairwise. Then we had the eight losses – but against maybe the three best teams in the country. St, Cloud won 30 games. North Dakota won the national title. Denver made it to the Frozen Four. He hopes young players who flashed early in their careers but then slumped will click again. Only time will tell how new faces blend with veterans. “The guys like each each other, they get along, but we’ll see. It’s real competitive now. They’re more concerned about jockeying for position right now than they are team-building. Guys are worried about if they’re going to be on the top line or in the stands watching because we’ve got 27 hockey players and we can only dress 20 in a game. He’s curious how this club’s team dynamics shape up. “They’re coming together as a group right now. I try to move guys around to find that chemistry and we haven’t found it yet. Ortega, a goal scoring machine, is back for his senior year with school career scoring records within reach. The Mavs lost Guentzel to the NHL’s Pittsburgh Penguins. “They’re good guys off the ice – they’re great in the classroom. Blais expects losing Guentzel, whom he “considered the best player in college hockey last year,” to be offset by quality depth. UNO appears especially deep at goalie. He knows his underclassmen must contribute big time. He bristles at any notion that at 65 he’s losing his edge. “Well, if somebody says I don’t have the hunger or the will to win I’ll have a boxing match anytime they want. I’m always ready to go. I’m up at 5:30 planning my practice, putting lines together. I recruit as hard as anyone. I’ll jump in the car and drive 10 hours to see a game. I’m in the arena all day long. Follow Blais and his team at omavs.com.